I’ve never seen a saint bashing herself in the face with a pair of pincers before. But as I entered Michael Landy’s Saints Alive exhibition at the National Gallery this morning, there guarding the way in was a 3 metre tall St Apollonia, in a floor-length red dress. You press the foot pedal at her feet, and lo! The pincers she holds with both hands jerk upwards into her face with a crash, powered by the wheels and cogs in her chest. All that’s missing is the opening of the Monty Python theme tune. Michael Landy is famous for destroying all his worldly possessions in an installation art event called Break Down in 2001. He was invited to be the National Gallery Associate Artist three years ago and in that time has sampled and remixed images of martyred and wounded saints from the gallery’s huge collection of Renaissance paintings. With the help of old prams wheels and bits of machinery salvaged from skips, flea markets and eBay, he’s turned the saints into large sculptures which alarmingly whirr into life at the kick of a pedal. There’s a lovely bust of St Francis gazing adoring at a crucifix held close to his face. You pop a coin in the slot and the crucifix whacks him in the face. There’s a torso of St Jerome connected to a muscular arm holding a big stone. Hit the big red button on the floor and the arm bashes the stone into the chest. This alarming sight is taken directly from the story of the saint taking his mind off the dancing girls of Rome in the way he found most effective. It struck me that the sculpture will probably destroy itself before it gets to the end of the exhibition’s six-month run. The torso is only glass fibre after all. I’ve never seen anything like this unlikely marriage of Catholic piety and amusement arcade, and it provokes an equal dose of comedy and reflection. Michael Landy, who was brought up as a London Catholic to Irish parents, is struck by the way the lives and sufferings of the saints, once popularly known through The Golden Legend and other books, have now passed out of popular (and even religious) culture. Landy could have chosen all sorts of saints from the National Gallery collection, but as he says, ‘I chose the more destructive saints’. He was especially drawn to St Francis, as people drew a parallel between the self-sacrifice of Landy’s Break Down and Francis during the 2001 event. In that sense, Saints Alive is an artistic take on people who were counter-cultural, who were determined to follow their faith to the point of self-destruction. ‘The saints are all very single-minded individuals. That’s what I like about them,’ says Landy. Two of the exhibits were out of action this morning, one of them a headless, kneeling figure of St Francis, hollowed out. A mechanical grab suspended above the figure lowers into the body and if you’re lucky comes out with a t-shirt you can keep. The t-shirt has a drawing of a knotted rope with the words, Poverty Chastity Obedience. I overheard a member of staff talking about the mechanical breakdowns and asked him about it. ‘I’ve been here a week,’ he said, ‘and every day at least one of the sculptures is broken. The machinery is made of salvaged motors and they’re not up to being operated so many times a day.’ They’re now waiting for new motors, so hopefully the saints will be moving mightily again soon. He very kindly allowed me to take some pictures, despite the gallery’s no photography policy. In keeping with the exhibition’s destructive themes of self-sacrifice, torture and martyrdom, Landy’s intention is that the sculptures will gradually wreck themselves, and the frequent collapse of second-hand components is probably part of that too. It’s also a very good marketing ploy. I want to pay a second visit to have a go at getting that t-shirt. 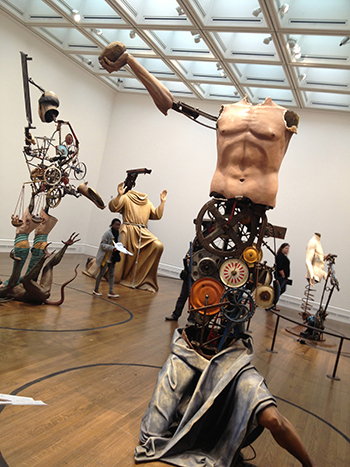 Saints Alive by Michael Landy is at the National Gallery, London, until 24 November. If you can’t get there, the exhibition catalogue is worth ordering (£9.99).